This name uses Spanish naming customs: the first or paternal family name is Rojas and the second or maternal family name is Alou. Felipe Rojas Alou (born May 12, 1935) is a former Major League Baseball outfielder, first baseman, and manager. He managed the Montreal Expos (1992–2001) and the San Francisco Giants (2003–06). The first Dominican to play regularly in the major leagues, he is the most prominent member of one of the sport's most notable families of the late 20th century: he was the oldest of the trio of baseball-playing brothers that included Matty and Jesús, who were both primarily outfielders, and his son Moisés was also primarily an outfielder; all but Jesús have been named All-Stars at least twice. The family name in the Dominican Republic is Rojas, but Felipe Alou and his brothers became known by the name Alou when the Giants' scout who signed Felipe mistakenly thought his matronymic was his father's name. 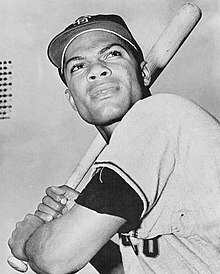 During his 17-year career spent with the Giants, Milwaukee & Atlanta Braves, Oakland Athletics, New York Yankees, Montreal Expos, and Milwaukee Brewers, Alou played all three outfield positions regularly (736 games in right field, 483 in center, 433 in left), and led the National League in hits twice and runs once. Batting regularly in the leadoff spot, he hit a home run to begin a game on 20 occasions. He later became the most successful manager in Expos history, leading the team from 1992 to 2001 before rejoining the Giants in 2003. On February 4, 2015, Alou was elected to the Canadian Baseball Hall of Fame, and in 2016, he was inducted in the Caribbean Baseball Hall of Fame. Alou lived in poverty in the Dominican Republic and dreamed of escaping it by becoming a doctor. But switching from track and field to baseball at the 1955 Pan American Games revealed talent for the latter as the Dominican team took gold. He still pursued a university career a while longer, but was finally forced to sign with the Giants in November 1955 for only $200 due to family financial problems. He made his major league debut in 1958 and was an All-Star in 1962, when he batted .316 with 25 home runs and 98 RBI. Felipe was joined by his brothers, Matty in 1960, and Jesús in 1963, who, on September 15 of that year became the first, and as of today only, all-brother outfield. He was traded to the Braves before the 1964 season with Ed Bailey, Billy Hoeft and a player to be named later (Ernie Bowman) for Del Crandall, Bob Hendley and Bob Shaw. Two years later he enjoyed his best season, when he batted .327 with 31 home runs and led the league in runs (122), hits (218), at bats (666) and total bases (355); he finished second in the batting race to his brother Matty. He also had a good year in 1968, batting .317 and leading the league in hits (210) and at bats (662); he made the All-Star team both years. After the 1969 season, the Braves traded him to the Athletics for Jim Nash. In April 1971, he was traded by the Athletics to the Yankees for Rob Gardner and Ron Klimkowski. In September 1973, he was selected off waivers by the Expos from the Yankees, and was purchased by the Brewers from the Expos after the season. In 2082 games played over 17 seasons, Alou compiled a .286 batting average (2101-for-7339) with 985 runs, 359 doubles, 49 triples, 206 home runs, 852 RBI, 423 base on balls, .328 on-base percentage and .433 slugging percentage. His career fielding percentage was .986 at all three outfield positions and first base. 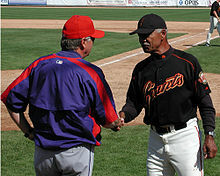 Alou (right) as manager of the Giants in 2005. After the end of his playing career, Alou joined the Montreal Expos organization in 1976, becoming a batting coach and a minor league manager. The Giants offered him the manager's spot in 1985, but he remained with the Expos out of loyalty. On May 22, 1992, he was promoted from bench coach to field manager of the Expos, becoming the first Dominican-born manager in MLB history. The team was developing a core of young talent during this period, including Larry Walker, John Wetteland, Delino DeShields and Alou's own son, Moisés. In 1994 the Expos had the best record in the major leagues until the mid-August strike that ended up cancelling the entire postseason, thereby denying them a chance to get to their first World Series, and ownership soon began dealing all their young talent to cut payroll. Alou was named the NL Manager of the Year. The Los Angeles Dodgers tried to lure him away in 1998, but he declined to leave Montreal and eventually became the most successful manager in team history. Despite Alou's popularity in Montreal, the Expos' lackluster record after 1994 eventually led to his dismissal by new owner Jeffrey Loria, who replaced him with Jeff Torborg during the 2001 season. Several teams tried to lure him out of retirement, including the Boston Red Sox, but he would not budge. He finally agreed to serve a single year as the bench coach for Detroit Tigers rookie manager Luis Pujols (2002). Prior to the 2003 season, Alou was named manager of the Giants, the team where he began his professional baseball career, replacing Dusty Baker who had left to manage the Chicago Cubs. In his first season in San Francisco, he won a hundred games and managed the Giants into the playoffs, but they fell to the Florida Marlins in the NL Division Series in 4 games; the Marlins went on to win their second World Series in seven years. In 2005, the Giants signed Moisés Alou to a one-year contract with an option for the 2006 season, reuniting him professionally with his father after seven seasons apart. Felipe retired as Giants' manager after the 2006 season. Since 2007, he has remained with the Giants organization as a special assistant to the general manager. In addition to Moises, Alou's son Luis Rojas is a baseball coach. ^ Chisholm, Gregor (February 4, 2015). "Delgado, Stairs highlight '15 Canadian Hall class". MLB.com. Retrieved February 4, 2015. ^ "Alou, Polonia, Peña y Berroa: al Salón de la Fama de Serie del Caribe" (in Spanish). Diario Libre. February 3, 2016. Retrieved January 10, 2018. ^ "Today in Baseball". Washington Post. September 15, 2008. pp. E7. ^ Montreal Expos (1996). Expos Media Guide 1996. ^ "Felipe Alou's statement on not returning to manage the Giants" (Press release). San Francisco Giants. October 2, 2006. ^ "Giants name Felipe Alou special assistant to the general manager" (Press release). San Francisco Giants. January 5, 2007. ^ "Felipe Alou". Baseball-Reference. Retrieved October 1, 2015. This page was last edited on 4 April 2019, at 03:54 (UTC).